Aerospace engineer Mathieu Johnsson’s goal is ambitious - develop a turn-key, commercial, unmanned aerial vehicle (UAV) for creating 2D and 3D maps. He joined with 4 engineers to found Marble, a startup aimed at delivering cutting-edge, high performance drones. Cameras mounted to the underside of the drone will allow customers in the UK to rapidly make customized, high fidelity maps in the field. With his Form 1+ high-resolution 3D printer, Mathieu and his team are able to test and verify new ideas and prototype quickly. “Whatever design we make, we only need a few hours to have it manufactured with the Form 1+ ” said Mathieu, “This helps designers try unconventional or risky ideas, without hours of preliminary analysis.” For example Marble 3D printed a small version of their design before creating a final model for reviews with prospective clients. Marble Aero printed a library of custom parts for their drone, including an engine housing, winglets and even a miniature version to help them visualize the final product. As the process of development continues, parts are becoming more specialized. The Marble MRB-1, their first design, features a whole library of custom flush mounting screws, internally braced wingtips, and an engine mount designed to save weight while remaining stiff. 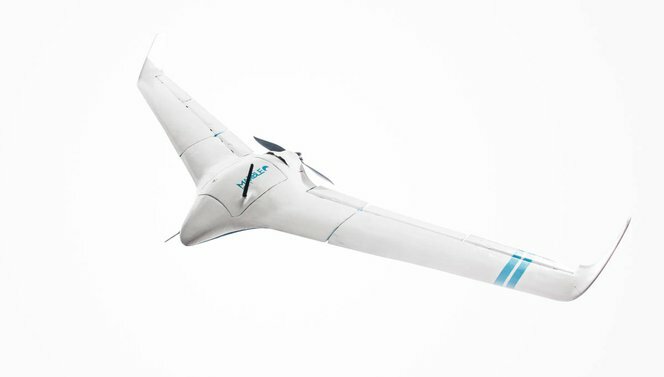 The MRB-1 has features removable wings and a composite body, allowing it to stay aloft for much longer than a quadcopter drone, while being easy to disassemble for transport. Marble innovated by selecting a blended wing design for their drone body, which is crucial for aerodynamic and structural performance, using composites and stereolithography 3D printed parts. By applying advanced aerodynamic designs with these construction techniques, the team was able to reduce drag and increase flight time. This will make the drone more effective for mapping applications, where more flight time allows for greater range of picture taking. Having a tool like the Form 1+ allows Mathieu to optimize the prototyping process. “We can now produce exchangeable modules thanks to the geometrical accuracy without the need for molded parts.” The team was also able to work fast, going from a blank sheet of paper to flying prototype in four weeks. The team has continued to iterate and is producing a series of test models to refine the aircraft design. In the Marble workshop, Form 1+ printed winglets are added to the sculpted foam body, with interior bracing visible through the thin walls. A modular pitot tube design allows the Marble team to quickly change components. In addition to prototyping, the Form 1+ also enables Marble to create short runs of complicated fixtures and fittings, as well as save the costs of expensive tooling. Want to check out the Marble prototype in person? Come see us showcase the models at Spacetech Expo, May 19-21, at the Long Beach Convention Center. Marble’s first drone, the MRB-1, takes to the skies.